Too fast, too furious. For every second you go out too fast in the first half of your race, you could lose as much as double that amount of time in the second half. 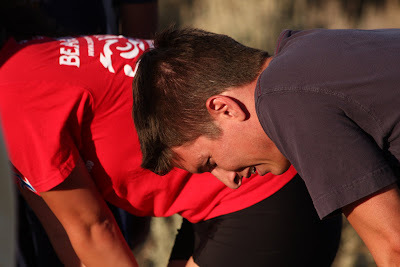 During my first 5k fun run, I went out too fast in the beginning of the race. I was keeping up with the pace of the other runners. Big mistake. After the first 2 kilometers, I was breathing heavily and couldn't make another stride. Felt like all of my stored energy was depleted. What should you do? Do not line up at the front. Best you stay somewhere in the middle or at the tail end in the assembly area. This way, you will be forced to slow down. Or have the discipline to properly pace yourself in the first mile then picking up your speed after. Shoes. Do we really need them?